Church and art have a common ground and history. The hope and desire to emphasise the meeting between those attending the Swiss Church for worship and those stepping through its doors to admire its architecture and cultural significance, sparked the idea for a collaboration with the MFA Curating at Goldsmiths University of London. The tutors on the curating course welcomed a dialogue and debate with such an interesting space as the Swiss Church, and embraced a more general engagement with the historic relationship between art, religion, architecture and community. 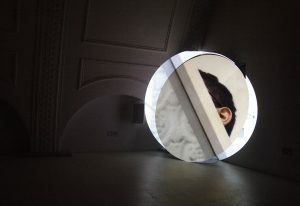 Since 2011, the Swiss Church and the MFA Curating programme at Goldsmiths have had a successful partnership and run a yearly competition for first year art curating contemporary art students, coordinated by David Mollin and Ele Carpenter, in collaboration with the Swiss Church team. 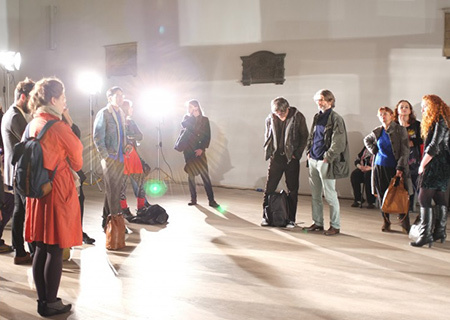 Students are invited to submit a proposal for a curatorial project that uses the space for one-two weeks, with the winner delivering their project in February/March. 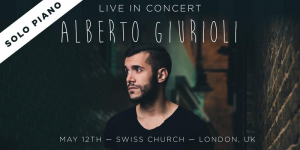 All applications are viewed and assessed by the Swiss Church Arts Committee. A contemporary art curator’s job entails being responsible for a researching, conceptualising and producing exhibitions, commissioing new art work, developing a context for the work through working in partnership, writing, and engaging audiences. 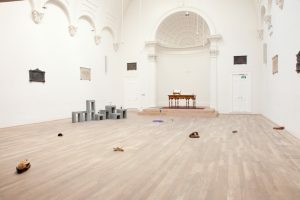 The exhibition at the Swiss Church gives students of the Goldsmiths programme the opportunity to develop all these skills through curating an art exhibition in a unique space, creating a dialogue between the sacred and the secular world. “The Table” developed by Marianna Lemos in collaboration with artists Laura Mallows, Rosa Johan Uddoh, Emily Perry and Munesu Mukombe. “The table carries a variety of differing associations. It evokes images of domestic intimacy, as well as ideas about horizontality and democracy. By default, however, it also represents methods of hierarchisation and exclusion- Who gets a seat at the table? Containing the potential to facilitate spaces of equality as well as of discrimination, the table simultaneously embodies mechanisms of both inclusion and exclusion. 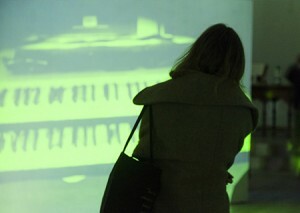 For further information, click on the dedicated website for the exhibition. Curators Camille Bréchignac and George Watson present a newly commissioned performative installation by Tyler Eash and Sara Rodrigues. 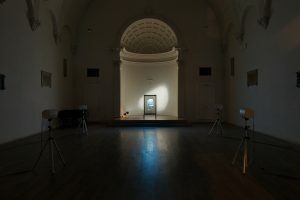 The work is informed by the artists’ interaction within the Swiss Church community, the performance taking as its point of departure interviews with the congregation on questions of mortality, faith and legacy. The focus on community extends to the curated conversation room – providing a comfortable space to converse about the exhibition. Find out more about the project, artists and curators here. The exhibition Hierophanies takes as its departure the 500th anniversary of the Reformation in 2017. During the process of Reformation, objects belonging to the church were stripped of their holy status, inducing a wave of iconoclasm, or the destruction of religious imagery. Patrick Hough’s exhibition reflects on the relationship between archaeology, technology and the reanimating power of digital cinema, in the context of contemporary iconoclasm – particularly the recent destruction of cultural and religious heritage throughout Syria and Iraq. 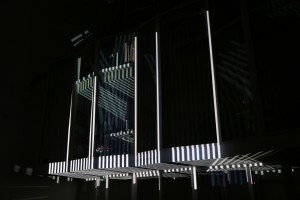 The installation Hierophanies in the main hall of the church consists of a large, transparent LED screen accompanied by several freestanding speakers. A continuously looping 3D animation depicts an artefact from the ancient ruins of Palmyra that was destroyed by the so-called Islamic State militants in 2015. Generously supported by the Max Geilinger Foundation. 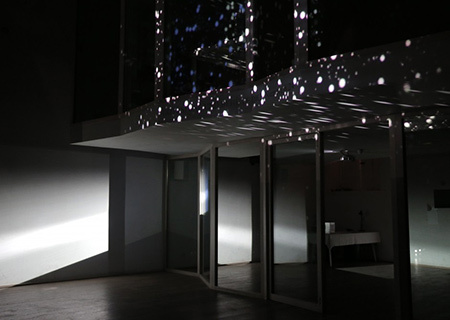 Crystalline Vitrine is a video and sculptural installation that derives its inspiration from the objects and community of the Swiss Church in London. 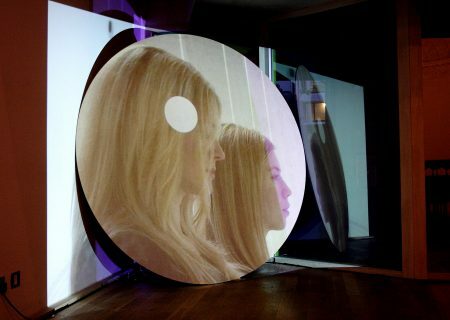 It makes reference to the transformative effects of digital technologies; which through their simulation of real life can lead to both distance and intimacy, spectatorship and participation. 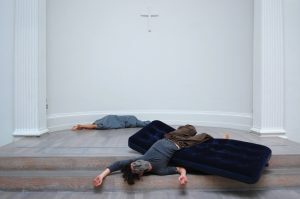 ‘Hear My Voice and Answer Me’ explored the vocal act of yodelling through sound, video and acoustics; curated by Nathalie Boobis in collaboration with artists Rachael Finney and Anna F C Smith, featuring artist Doreen Kutzke. These exhibitions have opened up different ways of experiencing the church and reflecting upon cultural and political investigations of the space. 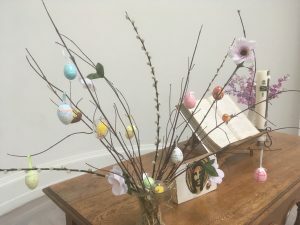 Julia Marchand’s exhibition ‘The First and the Last Folding’ presented new work by artists Pauline Beaudemont and Martin Soto Climent, who drew upon the symbolism of the Swiss Church to explore complementary narratives concerned with ritual order and religious orientations. 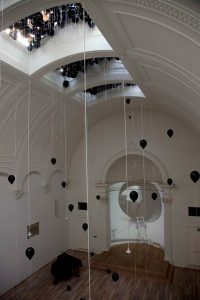 Heidi Brunschweiler invited Swiss Artist Monika Rechsteiner to present ‘In Transition’ which people may remember for the dramatic black balloons that slowly floated down from the ceiling throughout the exhibition. 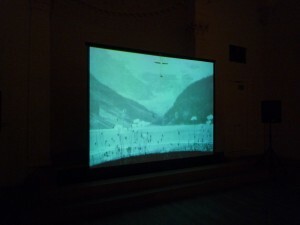 The installation included a video-montage of an abandoned nuclear reactor projected onto the apse which subtly addressed a possible relation between the field of religion and science. The programme started in 2011 with sculptural works by artists Davide Cascio and Ilona Sagar, curated by Anca Rujoiu and Manuela Schlumpf.